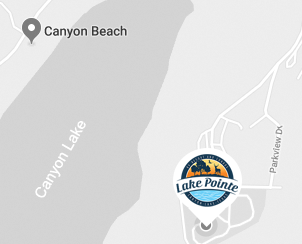 Lake Pointe RV Resort and Condominiums is located along the north shore of beautiful Canyon Lake in Canyon Lake, Texas. Canyon Lake is one of the premier recreational areas located between the cities of San Antonio and Austin in the Hill Country. Boating, skiing, fishing, and other water sports are within easy reach as are the sights and adventures that await in the two best Texas cities for arts, entertainment, and shopping bonanzas. 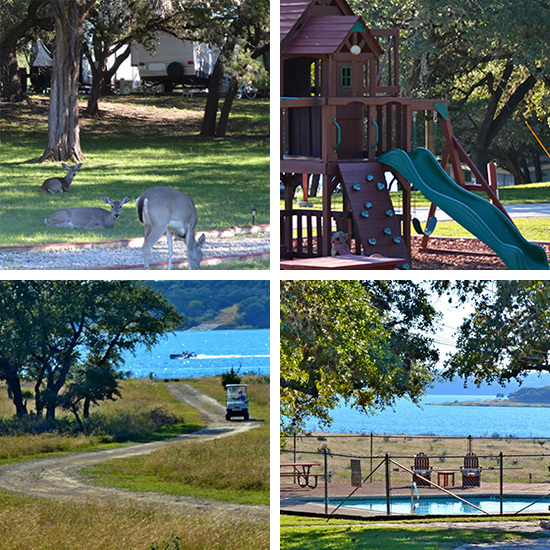 It’s all here at Lake Pointe… entertainment, peaceful camping, wildlife, and fantastic scenery. The Clubhouse is our meeting place, where we gather for a cup of coffee and conversation or just about anything else that we come up with. Everyone is welcome. The multi-layered deck is a great place to enjoy conversation, the wonderful sunsets, just a beverage or our cookouts. Junior Olympic Size Family Swimming Pool & Separate Adult Pool are available for your enjoyment. Both pools are fenced for your security. Children can run off that excess energy on the shaded playground. We have riding toys, swings, and playhouses to keep those little ones at play. Several shaded picnic areas are available. Bring your grill and enjoy a meal outdoors. One area is conveniently located next to the family pool. Take a bike ride or hike along the path on the banks of Canyon Lake or launch your kayak. Bring your boat while staying here and enjoy everything Canyon Lake has to offer the boater. Ample complimentary boat parking is available on the property for your use during your stay. Restroom and shower facilities are located in the Bath House near the Clubhouse and in the Recreation Building. Additional restrooms can be found in the Clubhouse. Lake Pointe offers a large, clean, fully equipped coin laundry facility with 4 washers and 4 dryers. Our entry point has a keypad operated gate and intercom system so that only registered guests can enter the park. We also provide Safety Reps who patrol the park in the evenings. Pets are welcomed at Lake Pointe. We have a fenced in dog run area for your furry ones to enjoy. Outside of the dog run, we do require pets be on a leash and, you must always clean up after them. For our full pet policy, contact our office. Memberships are available. For more information about pricing and benefits, please call our office at 830.935.4351.